Estonia's 100th Birthday! Celebrate Around North America! WASHINGTON, DC / ACCESSWIRE / February 17, 2018 / In 2018, Estonia will celebrate its 100th Birthday. The cultural history of this young county is rich. Ten thousand years ago, a Finno-Ugric tribe reached the northwest coast of modern Europe and settled on the Baltic Sea shore. Folks were amazed by the nature: dense forests, rivers, and lakes filled with fish; fertile valleys with black soil favorable for most plants. For a thousand years, many nations were trying to take over the Estonian land and peoples' hearts; however, the foreign spirit never took the place. Estonia always stood still for its culture and traditions. A hundred years ago, during WWI, this nation declared the independence of Estonia on the 24th of February 1918. The Republic of Estonia will celebrate its 100th anniversary in 2018 during the month of February around the world. Preparation for the holiday has already begun. For example, Turku city, Finland plans to honor Estonia's Independence Day by lighting up the Library Bridge with the colors of the Estonian flag. "Even if you're not in Estonia this year, you can join the celebrations around the globe," said Mike Calamus, the owner of Calamus-Enterprises.com and an Estonian who always support folkloric roots. Mike Calamus will be one of the organizers of the Estonian Anniversary social event on the 18th of February for all Washington, DC metropolitan area citizens. A reception will be hosted in the Golden Samovar restaurant, Rockville town-center in the atmosphere of relaxing dance music concert from 1930-1940. "This is a great opportunity to introduce to the guests of US Capital the best Estonian musicians, like Mart Sander and Swing Swindlers. We would like to share our culture with everyone. This year is more special than usual since the country celebrates 100 years of freedom," adds Mike Calamus. The Embassy of Estonia will celebrate their centennial with 100 Years of Estonian Music featuring vocalist Mart Sander and his big band on 26th of February 2018 in The John F. Kennedy Center for the Performing Arts. People can celebrate Estonia's birthday with worldwide events and programs. Estonian Culture Days are planned throughout North America. This year's celebration will feature folk dance, the famous artists of Estonia origin, music from The Baltic region, and guest speakers. Events will take place in New York, NY, Washington, D.C., Seattle, WA, Stanford, CA, West Palm Beach, FL, and in Canada - Vancouver, Hamilton, and Toronto. The 100th birthday will be celebrated over a longer period, not in a single day. Major celebrations in the USA are expected to start in Mid February 2018 - The anniversary's culmination will be February 24, 2018. All events are strictly non-profit and driven by mission. No musicians or organizers get paid or gain any profit. Estonians living in New York have been looking forward to the grand Estonia 100 celebrations for a long time as well. 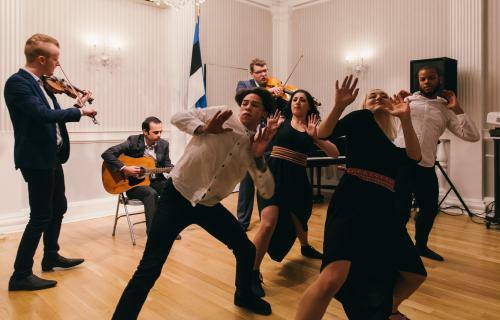 As part of the program, people will be able to attend various cultural events related to Estonia's rich cultural history and the modern interpretations of it. The year-round celebration culminates during last week of March with a cultural festival Estonian Cultural Days in New York, Estonia 100 Gala, and the choral concert Esto-Atlantis at Lincoln Center. "The magnitude of these events will bring together Estonians from across North America to reunite and celebrate the independence of Estonia," said the Creative Director of Estonian Cultural Days, Valev Laube. "It's a thank you letter to everyone that has contributed making the survival of such a small nation possible, as well as a steppingstone to build excitement and interest around Estonia." As a designer and marketing specialist, Valev Laube is also involved in many other Estonia 100 initiatives, including the launch of an Estonian themed jazz bar "Philly Joe's NYC," created by an Estonian artist and entrepreneur Reigo Ahven.